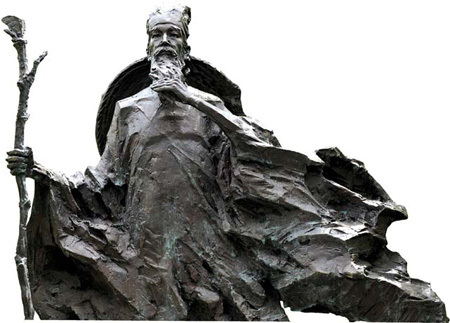 Su Dongpo (orginally known as Su Shi) (January 8, 1037--August 24, 1101) was a writer, poet, artist, calligrapher, pharmacologist, and statesman of the Song Dynasty, and one of the major poets of the Song era. Born in Meishan near Mount Emei in Sichuan province, Su's extant writings are of great value to contemporary understandings of 11th century Chinese travel literature and the iron industry. The multi-talented artist was often at odds with a political faction headed by Prime Minister Wang Anshi. He once wrote a poem criticizing Wang's reforms, notably a government monopoly on the salt industry. Banished to Huangzhou, now Huanggang in Hubei province, he occupied a lowly government post with no stipend. Near penniless, Su built himself a small residence on Dongpo (Eastern Slope) farm, from which he took his literary pseudonym and drew much of his artistic inspiration. His most famous piece of calligraphy, Han Shi Tie, was written at Dongpo. Su spent only four years in Huangzhou before returning to the capital to witness the creation of a new government. He was later banished to Huizhou in Guangdong province and again to Danzhou in Hainan island. But it was in Huangzhou that Su reached his literary zenith. There, he wrote most of his 2,300 poems and 800 surviving letters. It was about the settlement's Red Cliffs that he authored his best-known piece of prose, Chibifu (Red Cliffs Rhapsody). The work commemorates the fierce battle at Red Cliffs (AD 208-209) in which the direly outnumbered forces of the southern warlords Liu Bei and Sun Quan cunningly vanquished the massive military might of northern general Cao Cao. The victory sustained the national schisms that trisected the collapsing Eastern Han Dynasty (AD 25-220) into the Three Kingdoms (AD 220-280). Su's ode to the victory is essential reading for the country's primary school students. Su died at the age of 66 in Changzhou, Jiangsu province.